I had broccoli cheddar soup the other day for lunch and it was pretty solid - but like grocery store solid, not like "make at home" solid. 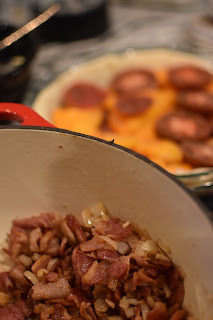 It reminded me that I had this recipe flagged from last winter but had not gotten around to it. To be clear, this is absolutely not a broccoli cheddar soup. It's a far healthier version. This soup is loaded with vegetables and has zero cream in it. In fact, it doesn't have cheddar either. Except for when I decided to cheat and sprinkle a little cheddar on as a topping. But, it is incredibly easy to make. I did this on like a Tuesday night after work and commuting home. I was half planning on just making an egg sandwich and then realized I bought the broccoli over the weekend. Broccoli soup it is. 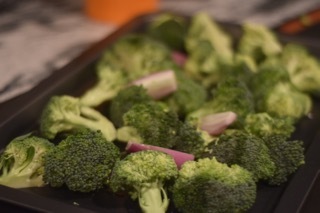 Prep the broccoli and lay on a sheet pan. Quarter the shallot and add to the pan. Drizzle with olive oil and roast at 425 for about 25 minutes. Turning as needed. Reserve about 1/4 cup of broccoli to the side (this is for topping). 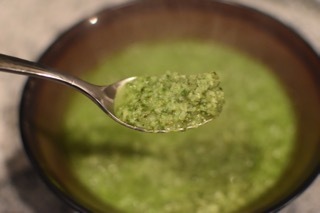 Add the roasted ingredients, spinach, chicken stock, and parmesan to the blender. Blend until evenly pureed. Add to a pot and heat until warm. Squeeze the juice of one lemon, and zest in the pot before serving. 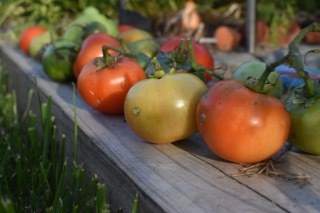 It's been about a lifetime since I was in the garden. I think the last meaningful time was when I was prepping for the "hurricane" that never was. 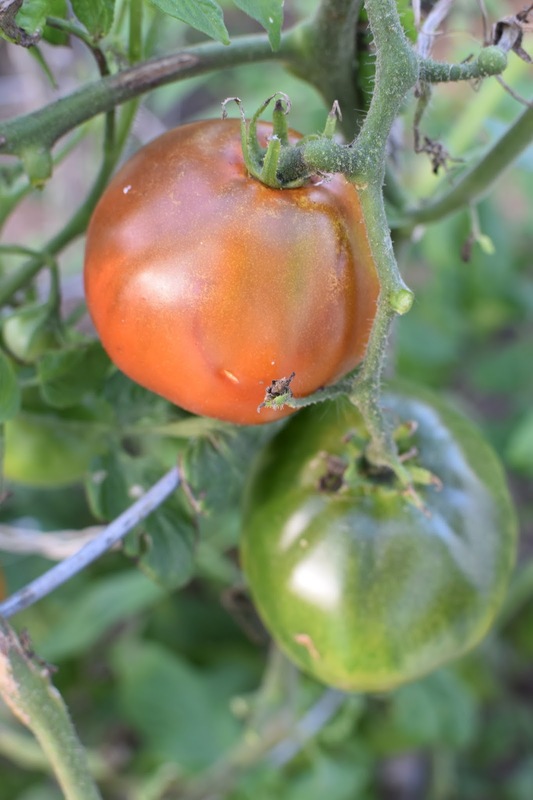 The worst part of that was I picked all of this fruit that largely ended up spoiling because I couldn't eat it, sauce it, or give it away fast enough. Quite the bummer. But this was the first Fall weekend when there wasn't a football game, bad weather, or a birthday party - so I got the chance to climb back in there and see what was left. The weather has been so warm for the last week or so that it almost felt like summer. After just over an hour, things began to feel under control again. The main goal was to remove dead or unproductive branches. 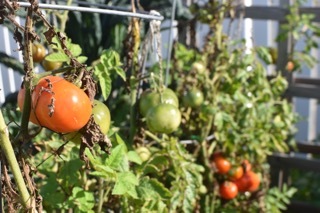 The secondary goal was to trim back the plants a bit heavily so as to concentrate all the growing energy on ripening the remaining fruit. An unexpected result? I ripped out a couple of plants completely. I do wish I had a couple more hours to get things back to normal for the last week or so of growing - but the super short days there just isn't much time for gardening before or after work. Really took for granted that I could go to work, come home, take a long walk, and spend some time in the garden before it got dark. Now? It's dark before I even get home. End result, this cleaning provided a good retrospective of what I really liked about this growing season. Every year I want to plant the black truffle, I always care about checking on its progress. I also really love the cherries but can barely eat all of them (never mind the rest of the produce). 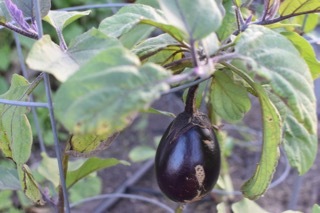 This plant got a lot stronger with the dip September dip in temperature. It really cements the logic that cucumber plants need to go in on the early side to develop better roots. Everything about this babe is heartier. There were a few itty bitty Mexican gherkins hanging around when I peeked under the leaves. PEPPERS // Beyond disappointing. Quite literally 3 peppers all season off of 5 plants? Yes, we had some super windy weather but still. I'm not exactly sure what I would plant instead but these were super dumb. CARROTS // So many. Like, so many carrots. Need to look into how I preserve them for the winter. Something about putting them in a box with sand and straw? BEANS // I tried to plant a second batch of beans. Didn't take off. They looked good at the start but never took over... even a little. They were so skinny and thin when I pulled them all out this weekend. No sign of beans. KALE // So much kale. 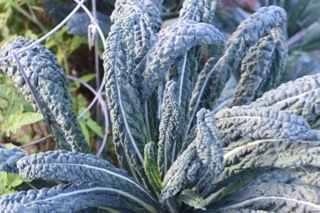 One of the great things about kale is how you don't really need to babysit it. It just grows and you pick it. But, right now I could go for some arugula and this weekend I had to buy spinach. I'd like to try and be a little more diverse about this next year. In a fantasy land, I have a tiny cold frame that I keep in the garden to keep greens growing a little longer. HERBS // I have never seen parsley so large in my life. It's like it's on growth hormones but I haven't fertilized (organic) in probably 2 months... 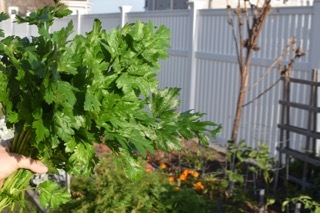 The basil is gone and the parsley swallowed the mint whole. I didn't even think anything could kill mint but apparently this parsley has super powers. Whenever summer leaves, I mourn the end of it hard. I'm not sure what exactly it is that I miss the most. It might be the extra hours of daylight, warmth, and limited expectations for productivity. I expect very little from myself during summer weekends. Take a walk. 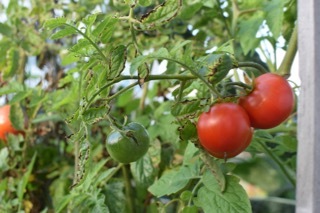 Take care of the tomatoes. Eat a BLT. But when October rolls around, I'm full on embracing Fall - especially one with this super warm weather. For the last two weekends, it's been beautiful and the leaves are turning and I'm loving it. I grab Ruby May and we hit the road to stretch our legs. She does not like the woods. So I literally end up lifting her out of the car at every stop - which is fun because she's a 60 pound dog shaped sand bag. Earlier this week I had a doctor's appointment which gave me the opportunity to see some leaves mid-week. It was really great. Like, want to do it more often great - which is of course hard because of work. But, I've scouted out a few other spots on the South Shore that could be good pre-work hike/walks or after work hike/walks in the Spring. In particular there is a trail across from a train station that made my heart sing. Every now and then I want to run, and this trail made me want to run. I really love macaroni and cheese. Like, really love it. It would be hard for me if someone were to tell me that I couldn't eat Kraft Macaroni & Cheese anymore. I'm a bit of a traditionalist. I don't believe in white cheddar, I just want normal Kraft. I also don't put milk in it. I don't like it creamy. I absolutely see my macaroni tastes being one of those things that even on my deathbed I'd have a hard time letting someone make for me. Thanks, but I make my own. But - I can't reasonably make (and serve) Kraft macaroni to thirty plus people. While it is feasible, it would be pretty odd to invite friends and family over for a 30th Birthday party complete with ceremonial koozies ... and then serve them boxed macaroni and cheese. I pretty quickly found this version of my goal on Food52. The first thing that shocked me was how much cheese and milk goes into making mac and cheese. Before attempting on the day of the party, I wanted to give this recipe a trial run. After stalling for probably a week, I finally got up the courage to make this meal from scratch. So I was incredibly surprised when it was completely easy and done in less than 45 minutes. Homemade mac and cheese is EASY! I am not sure I can go so far as to say "Easier than Kraft" but it's absolutely faster than Stouffers. And like all my favorite recipes, you can customize the hell out of it. 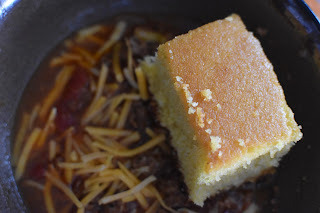 By the time it got to party day, I was totally ready to make this dish - except when combined with the honey cornbread and the chili, I kept miss counting my ingredients. After one trip to the store for eggs and honey, I couldn't bare another to get more milk - which is how we ended up with buttermilk mac and cheese. I do believe that the buttermilk was a differentiating "wow factor". There is no good reason for people to tell me they loved this dish as much as they did. It was clearly the buttermilk. Buttermilk - See above. Really, just use any milk. For the second batch, I had run out of buttermilk and ended up using almond milk. It was fine but the consistency of the creamy cheese was different. Buttermilk is the best milk. Panko topping - This dish had an insanely good crunchy top to it. I went with a moderately aggressive sprinkle of panko flakes combined with more sharp cheddar cheese. You'll have to broil it to get it SUPER crunchy but panko flakes are the way to go. During the trial bake, I split the pan between being half regular breadcrumbs - and it's just not as good. Panko flakes please. Make ahead - Initially I was looking for a dish I could make days in advance, a friend cautioned me that mac and cheese could be risky. While I made this the day of, you can easily do enough prep the day before to make it easier. Make your pasta, measure your cheeses, make your croutons. Croutons - Speaking of croutons, Martha's recipe called for them. I always have bread on hand but given the "hot dog" theme to this party, I opted to make them out of hot dog buns instead of white bread. The consistency is different but also lighter than normal bread croutons. Would absolutely use these in a pinch again. Heat oven to 375 degrees. Butter a 3-quart casserole dish; set aside. Fill a large pot with water; bring to a boil. Add macaroni; cook 2 to 3 minutes less than manufacturer's directions, until the outside of pasta is cooked and the inside is underdone. (Different brands of macaroni cook at different rates; be sure to read the instructions.) Transfer macaroni to a colander, rinse under cold running water, and drain well. Set aside. In a medium saucepan set over medium heat, heat milk. In the same pot you used for boiling the pasta, melt remaining 6 tablespoons butter over medium heat. When butter bubbles, add flour. Cook, whisking, 1 minute. Remove pan from heat. Stir in salt, nutmeg, black pepper, cayenne pepper, 3 cups cheddar cheese, and 1 cup Pecorino Romano. Stir reserved macaroni into the cheese sauce. Pour mixture into prepared dish. Sprinkle remaining 1/2 cups cheddar cheese and panko flakes over top. Bake until browned on top, about 30 minutes. If after 30 minutes, it's not browned to your liking, broil the topping rather than leaving it in the oven, which may cause the pasta to overcook and sauce to dry out. So, we've been planing the menu for this birthday party for like a month, actually probably more. When I first started to think about it, I thought about any dish that would be theoretically easy to prep ahead of time and wouldn't be bad leftovers. So with the menu set to be hot dogs, mac and cheese, and chili ... it felt super natural to do a cornbread too. People need their carbs. Then, when I was looking up recipes for "best ever cornbread" they got a little complicated. Making the best ever cornbread felt hard... especially for 30 people... and in a food processor. So, I said no thanks. We will be skipping on the cornbread. Flash forward to Friday night and I'm in line at the new local brewery. There was a group of guys behind us talking about eating chili and mac and cheese ... and how there was no cornbread. Obviously, my ears perked up and I had to chime in. They felt cornbread was a non-negotiable. Thus, we are back on the cornbread train with 18 hours to go before the party. The recipe I ended up making was incredibly simple and still got rave reviews. 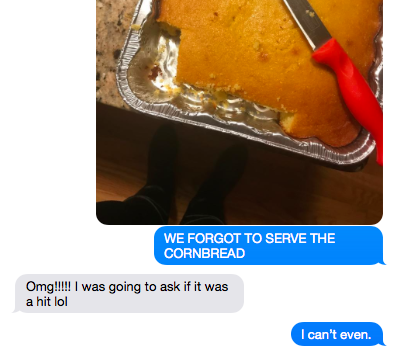 However, I pretty much died inside when as we were cleaning up for the night I realized that I never ever served the cornbread. It was still sitting on the counter all covered up. But, we cut into it and people said it was good so it can't be considered a total failure. I did end up eating it with leftover chili the next day ... and home run. I feel like I've been an idiot for just serving bread with chili for the last 10 years. From now on its honey cornbread or bust. Preheat oven to 375 degrees. Spray or lightly butter an 8x8 inch pan. In a medium mixing bowl whisk together the flour, cornmeal, salt and baking soda. 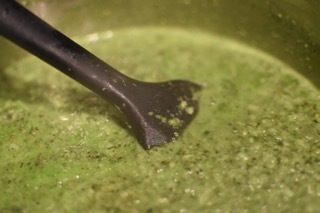 Gradually add the dry ingredients to the wet ingredients, stirring with a spatula until only a few lumps remain. Pour the batter into the prepared pan, smoothing the top with the spatula to create an even layer. Allow the batter to sit for 3 minutes before placing in the oven to bake. Bake for 25-35 minutes or until the top is golden brown and a cake tester inserted into the center comes out clean. Remove from the oven, brush the top with melted butter and honey. Serve! Prior to leaving the city, I don’t think I ever had so many “projects”. I’m honestly not sure what I did with all my time. I think I spent a little more time at the office and I worked out more. Like regularly, as opposed to the irregularly with which I get to yoga now. But, what did I do with all that time? I think the answer honestly might have been: taking walks, reading magazines, and dating. Well, I still enjoy a good walk and getting magazines in the mail - but dating is taking a back burner. I am now in a relationship with my house. Name sounds like a fruit, separated. Not ready for commitment, or honestly even to date. Dated for like 2 months (?). Met on Bumble, I think. Skier guy, pot-head from Somerville. Ended our date shockingly abruptly when he realized I didn’t live in Boston. One date. Met on Bumble. Environmental guy. Met on Hinge? I can’t remember. All dating apps are essentially the same thing. So boring. Bee Guy. Mutual Friend. Felt like we had a lot in common, but perhaps not “magic”. Some how in the course of the date it came up that he had bees - which I’ve wanted - and it just felt like things were going great. But I got the “just friends” text a week later. Local guy. He lives in the area and we had some mutual friends in common. No attraction, incredibly thoughtful - but not a match. Still texts to see if we can hang out. So for now, I’m really and truly focusing on everything but dating. I don't want to go so far as to say that I'm deleting the app from my phone but I'm "mentally" deleting it. Strangers, friends, enemies and neighbors are welcome to suggest a match - but I'm mentally taking a break from this aspect of my life. I’m in a relationship with my house, it’s pretty serious / long-term cause it’s a house. This could change but if I was to prioritize all the things I’ve been thinking about lately, dating is last on the important scale. First of all. I recognize that this just looks like a pile of melted cheese. But - it isn't. It is so much more than that. It is a tomato pie. Tomato Pie has been sitting on my kitchen to-do list for about a month. Pretty much ever since the moment I knew it existed. After all the times I've googled "what to do with all the tomatoes"... it was pretty shocking to me that I didn't know this concept existed. To be clear, the concept is not complex. 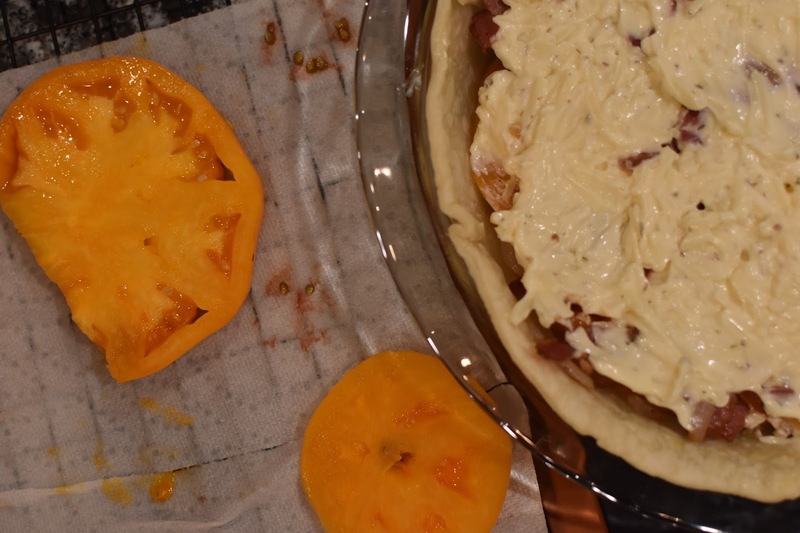 It's tomatoes in a pie crust plus some bonus item... but man, it is good. Maybe not the healthiest meal, but damn good. There are a few things to know about tomato pie but essentially it is very easy. 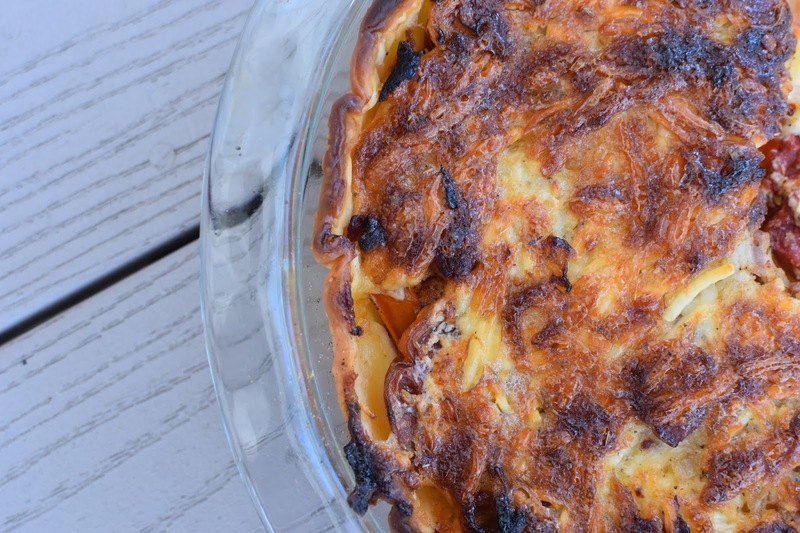 It becomes even easier when you don't make the pie crust. While I would normally like to be one of those people that makes their own pie crust, sometimes it just isn't worth it for an experiment. pie crust // just buy it. don't make life harder here. 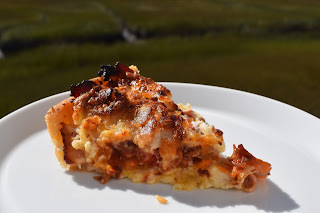 salty // it is very easy for this dish to get salty between the bacon and the tomatoes. I was a little more liberal with the salted tomatoes than I would be the next time. It's not the end of the world but just something to keep in mind. crust // don't get on your high horse about how mayo is gross and you don't want it on the topping. If you are that worried about it, just try to cut back the amount and maybe mix in some bread crumbs or something to give it structure. The crust is so incredible. I followed the original Food52 recipe pretty closely but have made some modifications to the process order below. While the recipe is simple, there is a lot of "do this quick thing and then wait a bit". So, a slightly adjusted order will help with speeding this whole show along. Slice the tomatoes and place them on a large cooling rack covered with paper towels. VERY lightly sprinkle the slices with kosher salt to help pull moisture from them, and cover them with another layer of paper towels. Let them sit like this for at least an hour. To blind bake the shell: Pre-heat oven to 375°F. Stab the crust with a fork all over and line the pastry shell with parchment paper. Bake for about 20-25 minutes, until the surface under the paper looks light brown. Remove the paper and return the shell to the oven for another 5 minutes or so, until drier and a more golden brown. 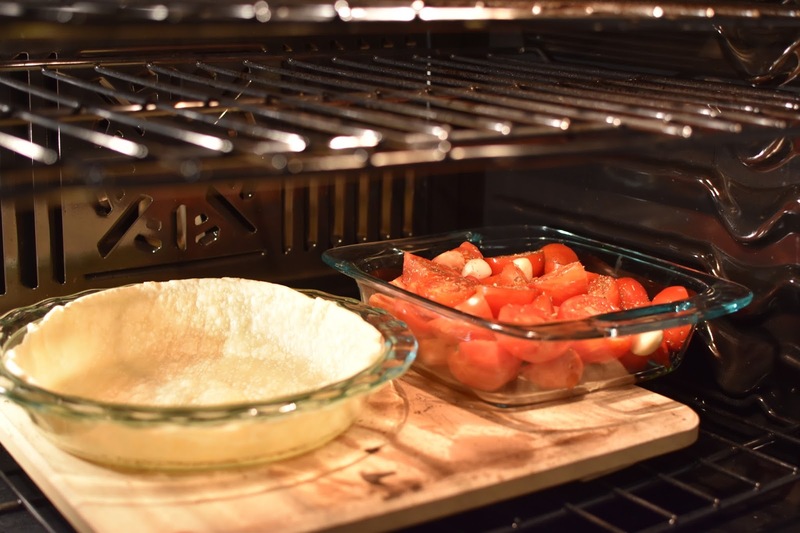 Remove the shell to a rack, and let cool completely before proceeding with baking your pie. 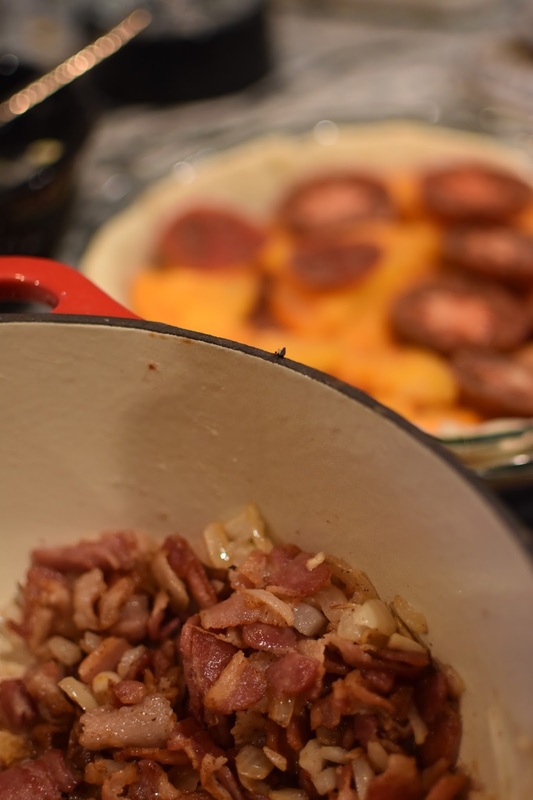 In a skillet, cook the chopped up bacon until it is just about crisp then add in the diced onion. Sauté until golden brown. Mix mayonnaise, grated cheese and oregano in a bowl and set aside. Set oven temp to 350°F. 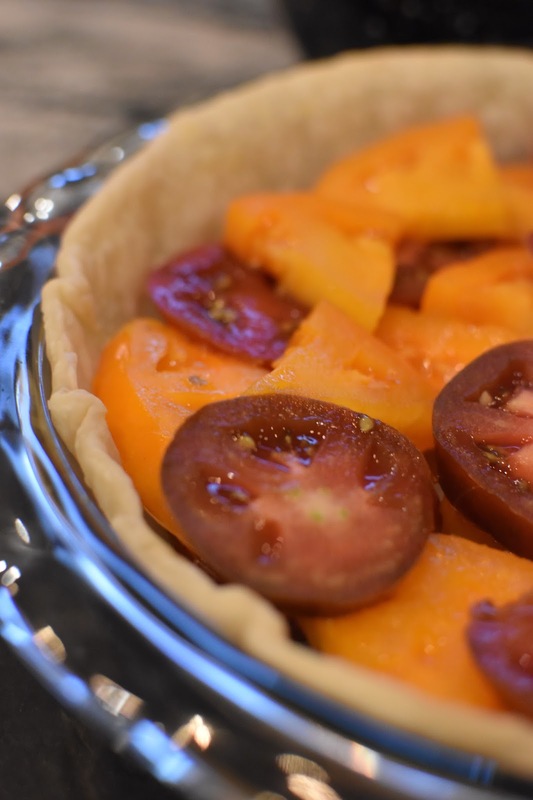 Assemble the pie by roughly chopping the tomato slices and spreading the pieces evenly into the pie shell. Generously cover the top with freshly ground black pepper, sprinkle with the onions and bacon, and, finally, top with the mayo-cheese mix. Place the pie in the oven and bake for about 1/2 hour, or until the top is nicely browned and the pie is bubbling. Remove from the oven and set on a rack to cool for at least 1/2 hour before cutting and serving.